This is so pretty! Just like the picture and the perfect weight for the bed. Not too heavy or too light. I would recommend it. 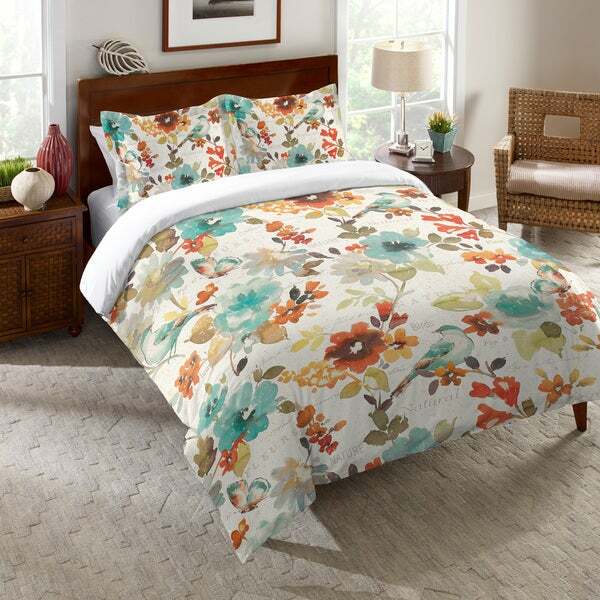 Bring a fresh pop of color into your bedroom with the Laural Home Nature's Garden Comforter. This comforter has a beautiful floral design that makes a stunning addition to almost any home decor. Best of all, this comforter is machine washable for easy and convenient care and cleaning. The fabric and the attention to details while sewing this comforter are outstanding! The pattern is beautiful and perfect for updating my master bedroom. However, it does not come with shams. (My fault for not reading carefully). They are not available on Overstock, so I will need to order them from another retailer. They will cost almost as much as the comforter! For the price, the shams should be included. Love colors, good quality. Thick & warm. Love the colors. Difficult to wash due to size and always has wrinkles.